SUMMARY: On Wednesday, November 28, 2018 at 9:00 am, investigators from the San Bernardino County Human Trafficking Task Force, initiated an investigation regarding an unknown juvenile female possibly being Human Trafficked from a motel in the City of Ontario. Investigators were able to locate an on-line ad, where the unknown victim was being advertised for prostitution. Investigators continued working the case until finally able to identify the victim in the advertisement, as being the 17 year old victim. Additional investigation placed the victim at an apartment complex located in the 26000 block of Cypress Ave. in the City of Highland. Task Force members authored a search warrant for the apartment and conducted surveillance. While in the area, a female juvenile fitting the description of the victim was seen walking with an unknown male juvenile. Officers from the San Bernardino City Unified School Police Department, assisted in the investigation by responding and detaining the juveniles. Both were transported to the apartment where Task Force members served the search warrant. While at the apartment, investigators contacted and detained Stephanie and Sheila Hill. As a result of information obtained and evidence located at the scene, Stephanie, Sheila, and the two juveniles were transported to the Highland Police Station for additional questioning. While at Highland Police Station, the female juvenile was positively identified as the victim. Through additional investigation and interviews, Task Force members were able to determine that both suspects (Stephanie and Sheila), had been involved in supporting, encouraging and profiting from the prostitution of the victim. The victim was given access to support services and placed into the custody of Child and Family Services. The male juvenile who was detained with the victim was determined to not be involved in the investigation and released to his mother. Investigators also learned that a 15 year old female lived at the apartment but was not home at the time of the contact. 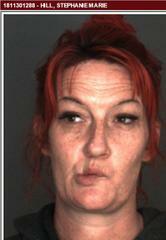 Investigators located her later that evening and placed her into the custody of Child and Family Services. Although the 15 year old was interviewed, her involvement as a possible additional victim has not been determined and the investigation is ongoing. Both suspects were booked into the Central Detention Center for felony charges of Pimping, Pandering and Human Trafficking of a Minor and are being held in lieu of $150,000. The San Bernardino County Human Trafficking Task Force is made up of investigators from the San Bernardino County Sheriff's Department, San Bernardino County District Attorney's Office, San Bernardino Police Department, Ontario Police Department, San Bernardino Unified School District Police, California State Parole, Office of Homeland Security and the Federal Bureau of Investigation. This investigation is ongoing. 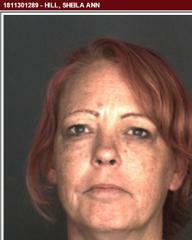 Investigators believe there are other unidentified victims related to this case and are asking that anyone with information related to this investigation, please contact the San Bernardino County Human Trafficking Task Force at (909)387-8400. Anyone wishing to remain anonymous may contact We-Tip at 1-888-78-CRIME or you may leave information on the WE-Tip Hotline at www.wetip.com.